That’s what it’s called and that’s just what ‘the girls’ did – dressed up for Ladies Day at Hickstead. The F&I Association’s yearly trip to the Royal International Horse Show means we have use of the BHS box which is fabulously placed for viewing the Main Arena and equally well placed for visits to the other arenas and more importantly the shops! We can bring along friends, spouses and partners for an extremely reasonable cost as BHS heavily subsidise this day for F&I. We are treated to coffee and biscuits on arrival and there are complimentary catalogues available for all, as we start the day with the Supreme Miniature Horse Championship. WOW! If they were any bigger some of them would be very difficult to handle they are bad enough as miniatures!! Lunch is sumptuous and beautifully served whether you wish to sit inside the box at the lovely big round tables or outside on the balcony watching the Supreme Hack Championship and then the Double Harness Scurry Championship. WARNING arrive early if you wish to ‘book’ a balcony table and then make very clear that it’s “yours”. The important part of the day comes next – The Course Walk. Each year the intrepid Karen Irving organises for a group of us to walk the course with an expert, so again early booking is very advisable as only twenty of us may walk with this VIP. This year we were guided round the course by Matt Sampson, who later rode Ebolensky in the Speed Classic. Matt was a font of all knowledge as he guided us from fence to fence answering questions, pointing out distances and difficulties and allowing for photo calls along the way. Karen then organises a Sweepstake, for the princely sum of £1 you can draw a competitor from the hat and then settle back to watch and cheer your own rider in their attempt to win the Queen Elizabeth 11 Cup. Cheering does at times get rowdy after all we are for the most part fairly competitive people!! However, watching these riders tackling the fences seeing them make the distances we walked takes on a different perspective for each of us and I think that also depends on one’s own preferred discipline. Following the Queen’s Cup there’s time for a breather before the last jumping class of the day The British Speed Classic, the winner of the sweepstake can count their coins whilst the Small Hunter Championship is judged. The Best Dressed F&I Lady was a new innovation this year and once again the BHS came up trumps with a bottle of fizz. The well-deserved winner was Annette Christie who looked a delight in cream with a smart little navy hat. It’s been a long day for my guests as I ‘made’ them arrive in the box by 9.15am, there’s just not enough time when you’ve flown in from Dublin the evening before and you’ve just got the one day so we made our weary way back to Gatwick and arrived home about 2am. But it’s just so worth it, catching up with friends and BHS staff, Karen, Alex, Michele, Jo, Natasha, Alison to name but a few and our CEO Lynn who makes us all so welcome. “ Mr BHS” David Sheerin was with us for the first time this year and had a whale of a time, he was tasked with the job of escorting one of our party, Joan O’Connor from Dublin, to the Finals of the Show’s Best Dressed Lady. Joan was runner up and donated the beautiful bouquet of flowers to Matt Sampson for his girlfriend. Then there’s the networking which is on-going throughout the day, some F&I members went across the watch the dressage whilst others trawled the showing rings where Simon Somers was to be found busy working. This is the F&I Association at its best, enjoying ourselves whilst learning in the presence of the “Mother ship” the British Horse Society. Following on from a brilliant morning at the Willlie Mullins stables and an indulgent lunch the F&I members headed off to Irish Event rider Sam Watson’s yard. Sam began his international career when he represented Ireland at the Junior European Championships. Sam’s father John won a silver medal in the 1978 World Championships in Kentucky so eventing is in his blood. He started out in England being based with Lucy Wiegersma and with his best known horse Horseware Bushman has completed many 4* events including Badminton, Burghley and Kentucky. He also has a number of 3* horses including Horseware Lukeswell and Imperial Sky. We had the chance to meet Sam at Willie’s yard earlier in the day and found out his role within the Mullins stables. All of Willie’s horses get six weeks of flat work when they come back into work and Sam plays a big part in this by helping the work riders understand how a horse should work. Sam educates the riders on how to effectively and correctly work a horse in order to condition and strengthen them by using the scales of training. Sam was very focused on suppleness and straightness but also the power and strength of a horse. He pulled out three horses for us to look at in-hand and trotted up, Sam explained what he looked for in a horse and certainly had a liking for the sire Puissance as all three horses were by him in addition to Bushman. It was interesting to hear Sam’s preference when choosing a horse for eventing, he was less inclined to go for a big moving warmblood and commented that all his horses are at least 60% blood. He discussed the importance of choosing a horse with natural ability to allow him to develop it into an athlete for the sport and finding one with a good brain as you need a horse who doesn’t rely on its rider all of the time. He did mention however that Bushman was not a great mover or initially the most natural jumper but his trainability and big heart is what enabled him to succeed. Sam shared his new exciting venture EquiRatings with us, a risk management database for eventing to help improve safety within the sport, this is obviously something Sam is very passionate about. He also hopes in time change in the scoring format of eventing will take place by taking the emphasis off the dressage phase, watch this space. Sam had a lovely set up, he had 14 horses in work and the main yard consisted of a court yard of 22 sables with an immaculate tack room. We had chance to look around the rest of the yard, there were large spacious pens so horses could have more freedom and relax away from the main yard. Sam liked to promote relaxation in his horses in order for muscles to recover post exercise and commented on how horses cannot recover if they are box walking or unsettled. 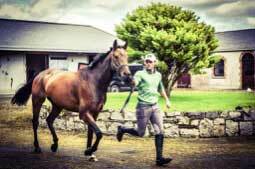 In the fields around the back of the yard there was Black Hercules a chaser from Willie Mullins’s who had been very successful but lost his way last season so Sam was hoping to help get him back to form. Sam then took us to see his indoor arena and outdoor schooling paddock which was surrounded by a sand canter track. His wife Sparkles was riding 17yo Bushman who looked amazing for his age and clearly enjoyed his exercise, Sam discussed how he likes to think about the mechanics of a horse when riding them and how he relates this to the work he does on the flat. Sam finished by riding 13yo Ardagh Highlight a horse who at times can become tense so he demonstrated the use of canter work, counter canter and adjustment of the canter between poles to help relax him while keeping the connection and making the hind legs work into the rein resulting in a huge improvement in the trot work. I am sure every member in attendance thoroughly enjoyed their trip to Ireland and on behalf of all of us thank you for arranging such a brilliant day.